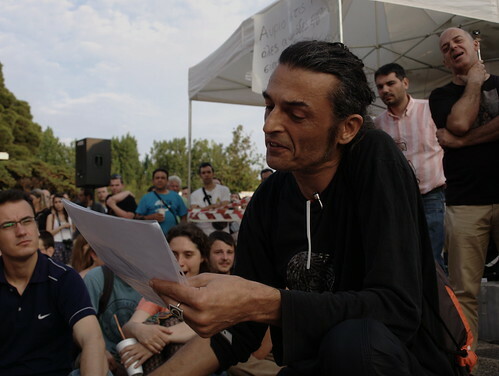 Greek Revolution: Day Six - man addresses open assembly, Thessaloniki, originally uploaded by Teacher Dude's BBQ. 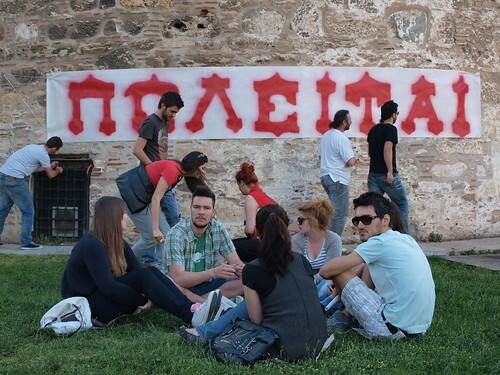 For more photos from the Greek Revolution click here. Greek Revolution - Thessaloniki 5th day, originally uploaded by Teacher Dude's BBQ. 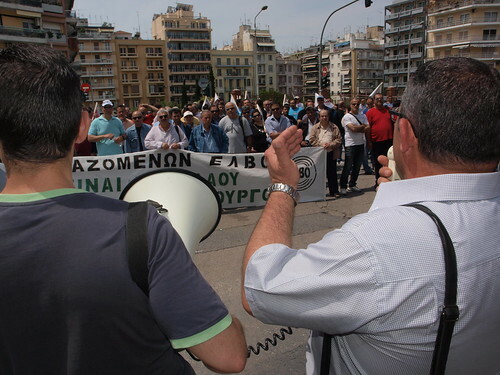 In Athens, Thessaloniki and score of other cities and towns across Greece, protesters have continued to attend rallies in protest against the government and the austerity measures demanded by the country's creditors. In Athens more than 100,000 gathered peacefully in the central Syntagma Square opposite parliament to express their indigbation with not only the policies ofthe ruling PASOK party but also with the whole political system in general which is widely perceived as being corrupt and unrespeonsive to popular needs. In Greece's second largest city, Thessaloniki thousands also rallied, taking part in open assemblies which lasted from 6pm till after midnight, despite torrential downpours. Debates not only focused on the current economic crisis but also touched on wider issues such as how the country should be governed. 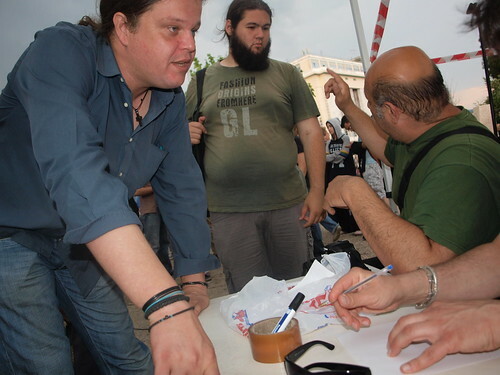 However, as the days pass demonstrators, following the example of Spanish, Egyptian and Tunisian protests have been organising themselves with internet camps, cleaning crews, translation groups being formed in order to get their message across and keep sites tidy. In sharp contrast to massive unrest that gripped Greece in December 2008 following the police shooting of a teenager the present demonstrations have been remarkably peaceful and have included a far wider ranger of ages and political views as ordinary people unaffliated with any political group have come to hear and share with others their own experiences. Ισπανίδα μιλάει για τις κινητοποιήσεις στην Ισπανία και για την επίθεση της αστυνομίας στην Βαρκελώνη, στην συνέλευση των Αγανακτισμένων στον Λευκό Πύργο. A Spanish woman addresses an anti - government rally in the northern Greek city of Thessaloniki, sending messages of support and solidarity to those present. Video on Youtube. 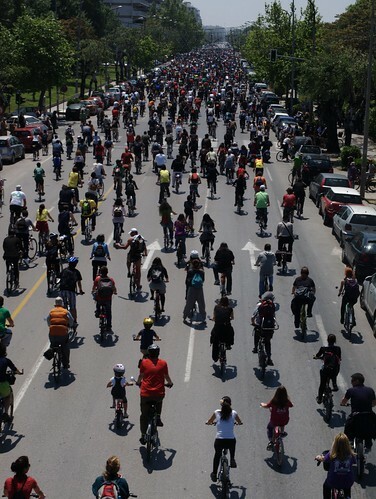 With an estimated 30,000 taking to Athens's central Syntagma Square and 8-10,000 massed in Thessaloniki, the country's second largest city Greeks has been protesting against the latest round of asuterity measures and the performance of the country's political caste in general. Sign in Greek saying "ForSale" on side of historical monument. 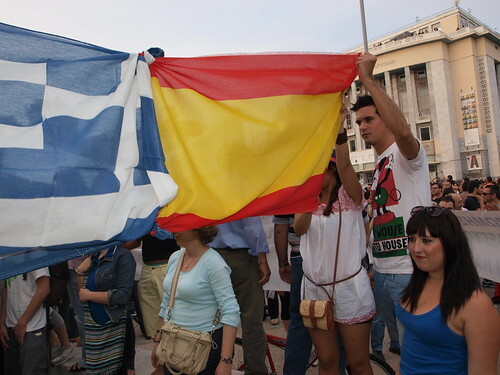 Greeks take to the streets again in second day of Spanish style protests, originally uploaded by Teacher Dude's BBQ. Gathering in cities across the nation Greeks have once more gathered in peaceful protest to show their disatisfacation not only with the current ruling PASOk party but also the Greek political system in general. In a campaign organised via Facebook and inspired by similiar Spanish protests thousands shouted anti-government and ant- IMF slogans. In Athens more than 15,000 remain in front of the country's parliament despite rain. 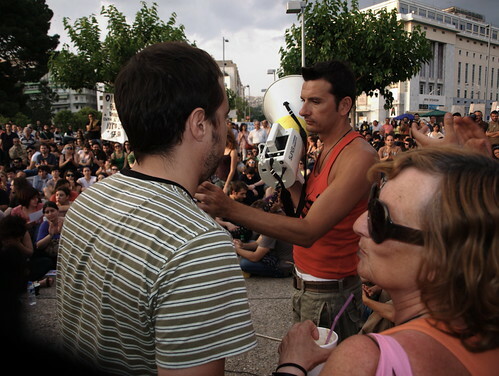 In the northern port city of Thessaloniki thousands rallied outside the town's White Tower in symbolic protest, while several hundred took part in impromptu open air political debates, sharing views and personal stories of how the economic crisis has affected them. 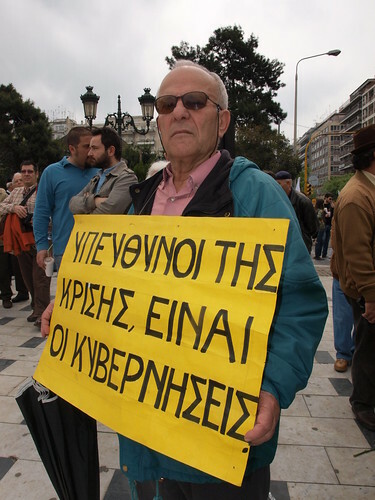 Greece's Los Indignados (Indignant) take to the streets, originally uploaded by Teacher Dude's BBQ. "With slogans such as Let's burn that bourdello, the parliament" and "We are nobody's hotel maid" thousands took over central roads and squares in a mixture of serious protest and street party. Despite the level of anger and upset many feel the Aganaktismenoi (Indignant) as they call themselves staged peaceful protests with no reports of clashes with the police. The campaign which takes inspiration from similar protests in Spain has used Facebook, Twitter and blogs as well as more traditional media to get people out onto the streets and has given a focus to growing discontent Greece's embattled population feels not only with its creditors but also the ruling PASOK party who have imposed round after round of public spending cuts,tax hikes and lay offs. With VAT now being levied on even basic food items such as bread, milk and meat many household are worrying if they can make ends meets in an economy which is shedding jobs at an unprecedented rate and seems to offer little in the way of hope for people. For more pictures check out my Demotix story. "HOW TO START A REVOLUTION is a new documentary film revealing how one man's work has helped millions of people achieve freedom in the face of oppression and tyranny. 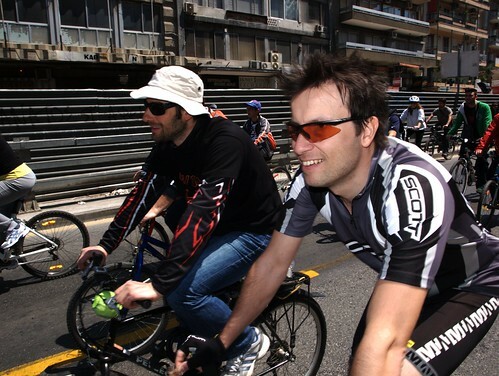 To make this film our director (Ruaridh Arrow pictured above) slept overnight in Tahrir Square in Cairo at the height of the February revolution. He’s met the leaders of the Syrian pro-democracy movement and the people responsible for overthrowing dictators in Serbia and Ukraine. He has spent time with Gene and his colleagues as they spread their message of effective non-violent revolution. Not only is this documentary an important film of record of the civil uprisings that have shaken the world in the last decade but we also hope it will help inspire future pro-democracy movements develop their strategies for non-violent revolution in the face of apparently overwhelming odds." 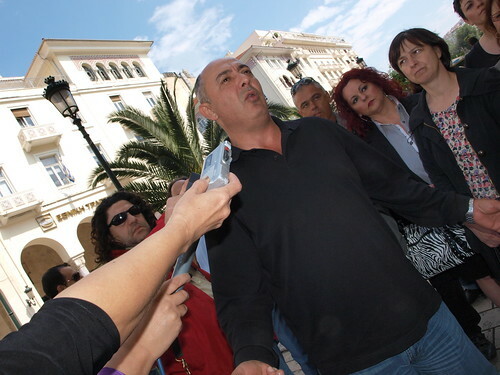 Greeks react angrily to latest austerity measures, originally uploaded by Teacher Dude's BBQ. Today the ruling PASOK party announced the latest round of austerity measures meant to put Greece financial house in order. Yet more increases in VAT (this time on basic food items such as bread and milk), a road tax hike, lower tax bands as well as a new privatisation plan. In other words more of the same kind of policies that have brought about an economic decline unprecedented in post war years and created an army of desperate unemployed who are being left to the mercy of the marketplace. Despite German media reports to the contrary Greece's not a paradise for the jobless with fewer than half those without work entitled to unemployment benefit. While other help is available, at least on paper, bureaucracy and lack of funds means that many who require help do not receive it. Despite the continued fall in the economy and a spiralling debt load Athens continues to follow the recipe led down by its IMF. EU and ECB creditors which has brought little but disaster and suffering to millions of Greeks on lower incomes. 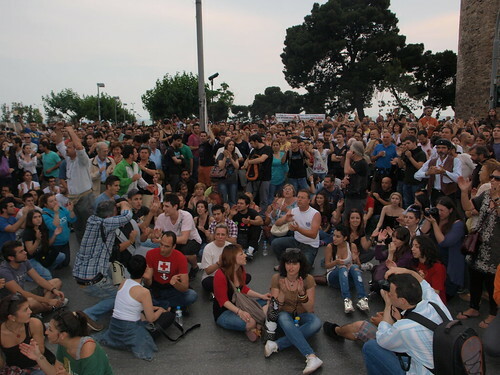 Tomorrow there has been a call for a Spanish style street protests here in Thessaloniki (6pm Wednesday outside the White Tower) so it shall be interesting to see if people respond. On the one hand there is certainly enough anger and indignation in Greek society but the experience of 18 months of severe economic downturn has sapped people's will to protest. Εμπρός Λαέ, μη σκύβεις το κεφάλι - Rise up, people. Bow your head to no one. Εμπρός Λαέ, μη σκύβεις το κεφάλι - Rise up, people. Bow your head to no one., originally uploaded by Teacher Dude's BBQ. 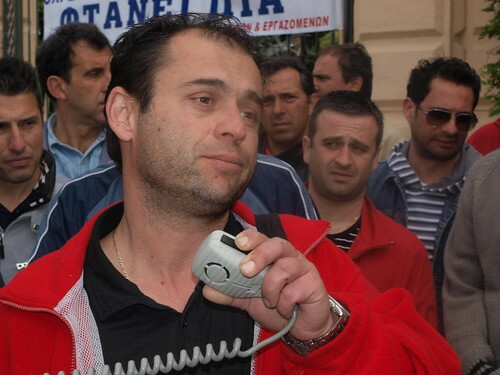 Greek health workers demand six months of back pay, originally uploaded by Teacher Dude's BBQ. Although Greek prime minister Giorgos Papandreou has repeatedly stated that his government will honour its debt comittments in full the ruling PASOK party has no qualms it seems about defaulting on the mountain of internal debt the state has racked up in terms of unpaid bills to employees and contractors in the health system. For more pictures check out the Demotix story. Antonis Samaras, head of Greece's main opposition party, New Democracy, originally uploaded by Teacher Dude's BBQ. 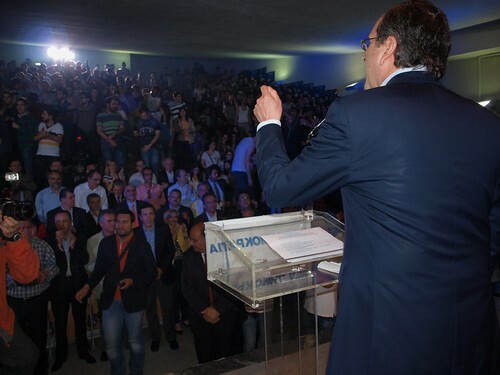 As conservative leader Antonis Samaras enters the lecture hall in the Aristotelion university of Thessaloniki, students who've have working themselves up into a frenzy fill the room with the kind of enthusiasm and passion that Greeks usually reserve for the victory of their favourite soccer team. 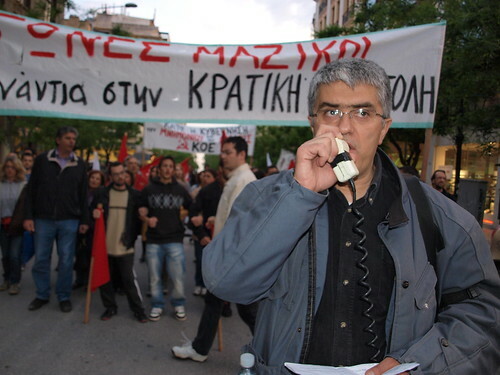 However, beyond the yells and chants the reality of the situation is the the country's main opposition party is in crisis, unable to rid itself of accusations that it, along with the ruling left wing PASOK party has helped bring the nation to its knees through a toxic mix of incompetent governance, corruption and deceit. Following his victory last year Samaras inherited from his predecessor, prime minister Konstantinos Karamanlis a party riddled with dissatisfation and dissent which can barely garner 20% in opinion polls with much of its policy platform usurped by Giorgos Papandreou's PASOK which has implemented a reform policy that includes a massive privatisation program, public spending cuts and a sharp reduction in the size of Greek state. However, New Democracy is on the horns of a dilemma, torn between endorsing an austerity package which includes many of the policies it tried to implement when in power while not being associated with a series of deeply unpopular policies which are opposed by the majority of the electorate. Samaras's position has not been helped by the divisive leadership battle which lead to the defection of New Democracy heavy weight (and daughter of party founder Constantinos Bakoyianni) who her formed Democratic Alliance (Dimokratiki Symmaxia) party in the wake of a failed leadership bid. The drop in support for New Democracy is part of a deeper problem of credibility which the Greek political system is facing. In the wake of a seemingly endless list of bribery scandals and flagrant abuses of office many Greeks are turning their backs on the existing parties which seem unwilling or unable to fight corruption within their own ranks. For more pictures check out the story on Demotix. 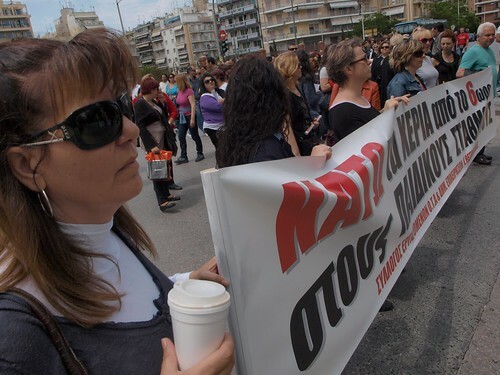 Workers from Greek town of Xanthi protest outside ministry building, Thessaloniki, Greece, originally uploaded by Teacher Dude's BBQ. This guy had just gone to speak with a representative of the government. I think his expression says it all. It's hard to express accurately to outsiders the level of contempt in which Greece's political class hold the rest of the country. The only thing that matches it is the disgust most voters feel for the politicians that supposedly represent them. Over the last three days two stories have dominated much of Greece's domestic news coverage and especially the TV news. The first concerns the tragic death of a 44 year old Athens resident who was murdered as he was getting ready to take his wife to hospital to give birth to their second child. According to newspaper reports the man was accosted by three assailents in the parking area of his apartment and when he refused to hand over a video camera he was carrying stabbed fatally. The second story concerns savage attacks by riot police in Athens on participants in yesterday's protest marchers held in support of the country's general strike. As the video above shows the police beat and kicked repeatedly marchers leading to the hospitalisation of over 20 including two who are still in intensive care. 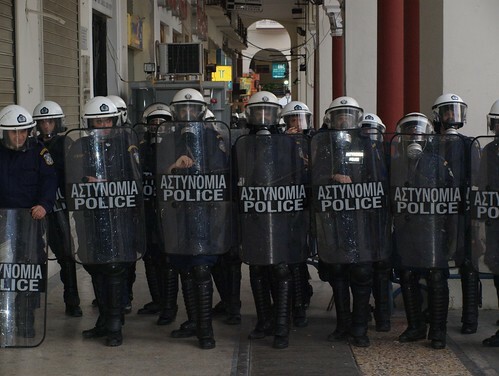 In both cases we are witnessing the failure of Greece's police force to deal with the challenges being wrought by wrenching economic changes and a rising crime wave. For too long the police have operated with impunity able to ignore short comings in both its ability to deal with day to day crime and an evermore restive population that is angry with the role of the government in the current financial crisis. On the other hand the lessons learnt following the month long wave of unrest that accompanied the death of a 15 year old at the hands of police officers in the Exarchia district of central Athens in 2008 have already appear to have been forgotten. 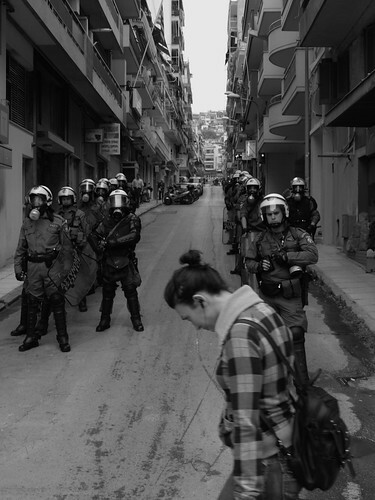 In the wake the December shooting of Alexandros Grigoropoulos riots and street fighting broke across Greece and lead to billions of euros worth of damage. Yet, less than three years later the lack of control both by the police authorities and the legal system over the conduct of officers has once more come to the fore. It is the same lack of accountability that has seen the police fail to deal with a growing crime wave which has turned some areas of Athens in no-go zones and allowed local far right to gain ground politically by setting itself up as the saviours of the locally born Greek population against a supposedly criminal immigrant element. Aided by media eager to scape goat foreigners for Greece's present economic woes extremists are filling the vacuum created by lack of effective, professional policing. However, the police authorities, despite the suspension of some officers following the Athens incident ares no mood to change their ways. 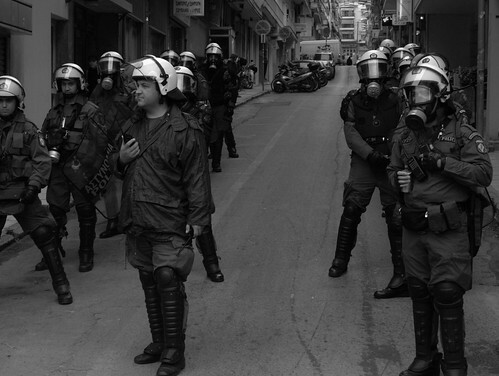 Indeed with the ruling PASOK party's popularity at an all-time low the government needs the police more than ever as it battles to impose deeply unpopular austerity measures on a angry electorate. In a country where no member of the government can appear in public without causing a near riot PM, Giorgos Papandreou's cabinet knows that it dare not push the police too far since it is next to helpless without them. Welcome to Greece - Enjoy your stay, originally uploaded by Teacher Dude's BBQ. Thursday night's demonstration against the savage attacks by riot police on marchers taking part in the protests in support of the Greek general strike on Wednesday. After a result 67 people needed medical treatment including a 30 year old who is in critical condition in a central Athens hospital. See here for photographs of the victims. May Day march in Thessaloniki, Greece, originally uploaded by Teacher Dude's BBQ.